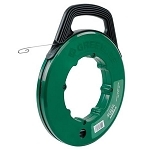 From Klein Tools comes a great product for helping in cable installations; none other than fish tape of course. Made of steel, clearly the pull tape is pretty durable, but it’s also thin (less than 1” thick) for sliding through small spaces. When using fish tape, one may need to measure multiple times to make sure the job is running smoothly. Not with Klein Tools Depth Finder tape— measurements for distance have been permanently laser etched into the steel fish tape, always visible, and illustrating the exact length being used in 1” markings. 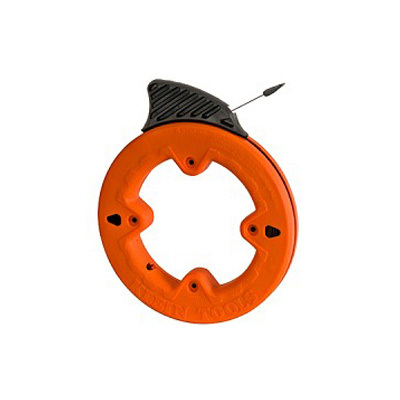 Secured in a bright orange, polypropylene case, the fish tape is kept safe from wear and tear or accidental drops on the jobsite. This winding case has raised finger grips to give you better control over winding and unwinding feed tape, is comfortable to hold while in use, and has an internal ring to prevent the steel fish tape from bundling up or snagging when being wound back up. The Klein Tools pull tape is predominantly used to run cables, but can accept 13 1/2" wound steel flexible leaders or swivel ball ends as well. Multiple lengths are available for a variety of cable installation applications with DepthFinder Steel Fish Tape. For additional knowledge about the product, please click the "Specifications" tab.